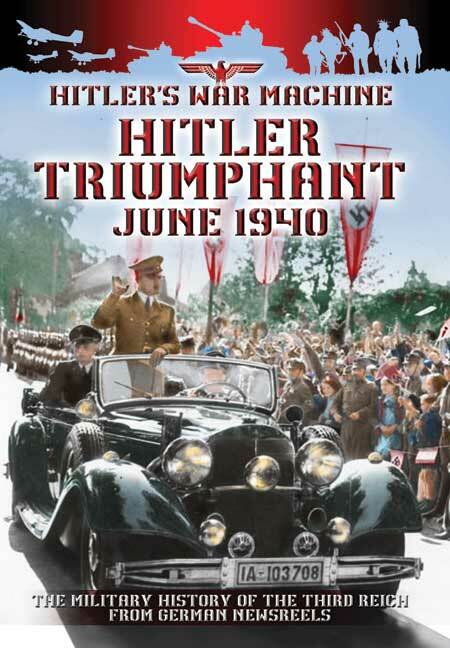 You'll be £9.99 closer to your next £10.00 credit when you purchase Hitler Triumphant 1940. What's this? Order within the next 6 hours, 44 minutes to get your order processed the next working day! The German Propaganda Kompanien (PK) captured the events of Hitler's war on every front. Their footage was used to produce Die Deutsche Wochenschau, a weekly cinema newsreel detailing the events of World War II on land, sea and air. For the first time these unique primary source films have been collated, edited and translated into English in order to produce a complete military history of the Third Reich drawn exclusively from German primary sources. This amazing range of films captures the events of World War II exactly as they were presented to contemporary cinema audiences while the actions on the battlefield were still unfolding. This volume features translated Wochenschau newsreels dating from June through to August 1940 and records the military events following the collapse of French resistance and the withdrawal of the BEF from France. Particular emphasis is placed on Hitler's triumphal return to Munich and Berlin.